The West Coast Eagles became a part of AFL National Draft history tonight – without even selecting a player on the opening night. With live trading being introduced to the draft for the first time, Sydney traded their No.29 selection in this ballot for the Eagles’ third round selection from the 2019 pool. The two clubs also agreed on a deal that sees Sydney receive the Eagles selection 25 in tomorrow’s order in exchange for the Swans second round selection in the 2019 draft. In effect, the Eagles have drifted four places in tomorrow’s order to get an additional second round selection in next year’s National Draft. The Eagles will still have two selections in the first seven in phase two of this current and unusual player lottery tomorrow and will open the batting. 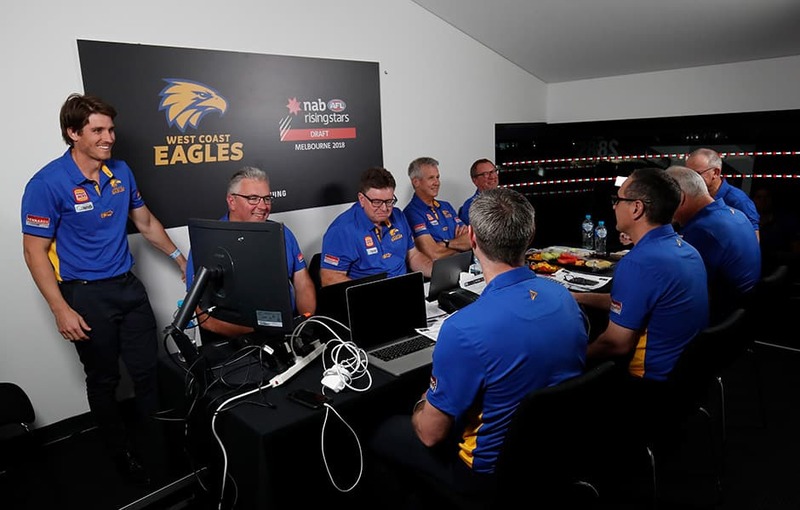 The West Coast Eagles recruiting staff will sleep on the decision around their first selection in the ballot after a landmark change to the system. For the first time the draft was split into two phases, with the first round selections being held at Marvel Stadium this evening and the rest of the player ballot being completed tomorrow. West Coast, the reigning premiers, were not involved in the opening night theatrics in the sense of locking down players, but were far from dormant. The Eagles are poised when the draft resumes tomorrow morning and the recruiting staff will be able to contemplate the remaining talent overnight before entering the fray to secure some of the best young players in the country. This draft pool was always considered to run deep, so the Eagles will be confident of bringing exciting youngsters to the club who will add significant quality to an already-talented squad. National Recruiting Manager Rohan O’Brien, List Manager Brady Rawlings and their staff have already evaluated the available talent, but will now drill down a little deeper in the knowledge that they have a definitive list of players open to their immediate selection. It is also possible they will field enquiries from other clubs looking to elevate their position on day two of the draft. It will be intriguing to see if opposition clubs are prepared to trade a future pick or selections in this ballot, to enter tomorrow’s action earlier. Tonight, Geelong Falcons midfielder Sam Walsh was secured by Carlton with the No.1 selection while South Australian star forward Jack Lukosius was snared with selection two by the Gold Coast Suns who then backed it up by nominating another Croweater, polished midfielder Izak Rankine. One of the unusual quirks on opening night was that Max and Ben King, twin brothers from Sandringham, were selected in the top six picks. Two tall forwards, Max was taken at pick four by St Kilda and Ben followed two selections later to Gold Coast. The first West Australian selected was Claremont utility player Jordan Clarke, drafted by Geelong at selection 15.